I'm Adoum Goulgué, I'm UN volunteer at the United Nations Stabilization Mission in Haiti (MINUSTAH). I work as a journalist-editor in the United Nations police (UNPOL) Section. But before that, I worked as responsible for public information at the publication unit, section of the Communication Office of Public Information, where I arrived on 01st July 2013. I have 10 years of experience in journalism, including four in the weekly newspaper in Chad, and four others as communication officer with humanitarian NGOs in eastern Chad. Port-au-Prince, Haiti: Im Adoum Goulgué, Im UN volunteer at the United Nations Stabilization Mission in Haiti (MINUSTAH). I work as a journalist-editor in the United Nations police (UNPOL) Section. But before that, I worked as responsible for public information at the publication unit, section of the Communication Office of Public Information, where I arrived on 01st July 2013. I have 10 years of experience in journalism, including four in the weekly newspaper in Chad, and four others as communication officer with humanitarian NGOs in eastern Chad. Serving as a humanitarian reporter in eastern Chad, that I had a better understanding of the Universe assistance. I met several people from diverse backgrounds, to assist Darfur refugees and local populations in Chad. I thought, why could not go help other communities? One day, a senior in my profession gave me his intention of becoming a volunteer, and this flashed my decision. I searched on the internet and go to the UNV online registration page. I registered, and six months later I received the first proposal photographer station to United Nations Operation in Côte d'Ivoire (UNOCI). I hesitated and then I got another proposal, this one led me in Haiti. As a volunteer working in a section where my teammate are peacekeepers, I am delighted to know that I bring to them something they need. 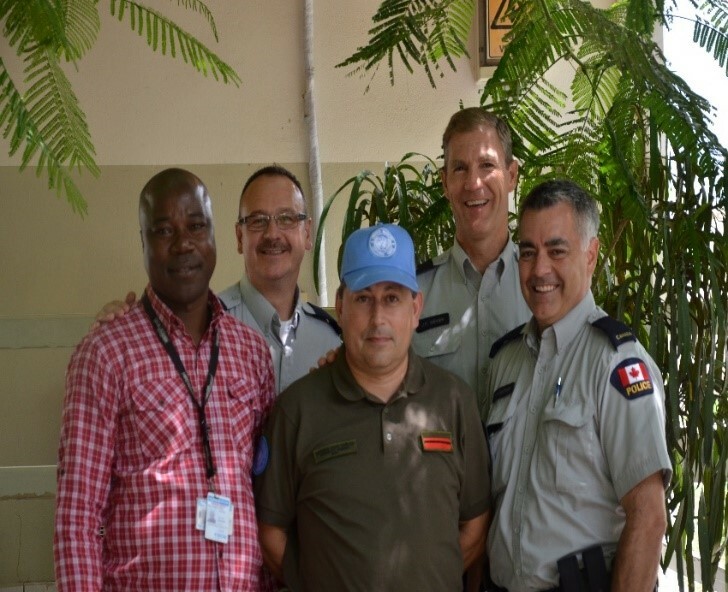 I conducted reportage missions in Port-au-Prince, at the airport Toussaint Louverture with Haitian Police and peacekeepers for drug check point. I also accompanied my fellow police officers in patrols during the carnivals events. Most of these activities are not covered by the local media. It's new for me to work with a uniformed body. Civilian and uniformed, have different culture of work. As a civilian, it's a challenge for me to understand the police culture, to better communicate our common activities. I find my volunteer work very exciting. As communicating, I have already worked on similar issues in Chad, social, poverty, human rights, and democracy. I feel at home. It is a passion for me to listen to people, talk their everyday life and their difficulties. And it is an honor for me to put these stories to the public but also decision-makers. For my participation in the group of MCs of the Peacekeepers' Day, the organizers have contacted me to be part of the group, they want all socio-cultural components of MNUSTAH to be involved. I accepted the proposal because it is a pleasure for me to perform this task on behalf of all United Nations volunteers in Haiti. I take this opportunity to call the world's citizens, especially young people to experiment the volunteerism.